In 2010, with less than a week's experience piloting a powerboat, we set out to circumnavigate America's Great Loop, 6,000 miles around Eastern North America. Our unusual vessel is an old-fashioned canal boat retrofitted as a solar hybrid vessel--a Prius of the Water. The boat's top speed is 6 mph, which is why we call our blog SlowBoatCruise. To read the Great Loop blog, click HERE. 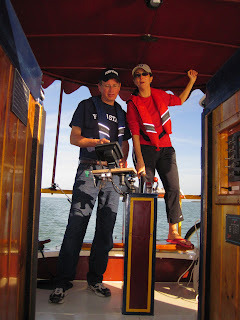 Bill Carlsen is SlowBoat's captain and chief engineer; Cynthia Berger is co-pilot, trip multimedia producer, and chief bow bunny. At the time of our first cruise, Cynthia was a radio reporter at NPR affiliate WPSU and a freelance science writer. Bill was a professor of science education at Penn State. Building Dragonfly's solar systems and making the Great Loop cruise was Bill's sabbatical project. Both Cynthia and Bill are now digital nomads. In summer 2018, SlowBoat cruised the historic canals of Canada. The Captain and crew of SlowBoat are biologists by training; Bill has studied marine biology and Cynthia has studied limnology (freshwater systems). They are married (to each other).